SWE 622, Spring 2017, Homework 1, due 2/8/2017 4:00pm. I have provided a basic implementation of CFS that mounts a folder of your Dropbox as a disk on your local machine. For Homework 1, you will implement a simple cache in the CFS client, improving performance by decreasing the number of times that the client needs to connect to Dropbox. For this assignment, we will assume that there is only a single instance of CFS running at any time. In all of the assignments we will assume that there is no way to write to your CFS Dropbox folder except through CFS. HW1: Implement the cache, given existing implementation of CFS, CloudFS and DropboxProvider. We’ll provide an implementation of everything but the memory cache: that’ll be your task for this assignment. Do NOT clone the publicly available implementation of CFS. Instead, sign up for the GitHub Classroom for SWE-622, and create your own homework-1 repository that starts off with our code. We assume that you already know how to use git. If you do not, you can check out tutorials, cheat sheet, or try the GitHub browser sandbox. We will provide only limited support with Git setup. If you’d like to do your development in eclipse, generate an eclipse project file using the command mvn eclipse:eclipse (execute this in the fusedriver directory). There are several main classes that make up the CFS driver. Take a look at them and examine the comments. The main class that implements the FUSE filesystem driver. The CloudFS abstracts away a lot of the functionality of a filesystem driver (e.g. seeking through files) and instead delegates some higher level operations to the CloudProvider. You should not modify either class. The CloudProvider specifies an interface for a simple file system. CloudProviders are delegating – a CloudProvider might choose to handle a file operation itself, or if it can’t, to let another one handle it. You should not modify this class. Take a look at the functions of CloudProvider. The most important functions are get and openDir – which will get the contents of a file and read the contents of a directory (respectively). These functions are passed a pointer to a CloudPath – and function by calling setXXX on that file or directory to tell CFS information about the file or path. The DropBoxProvider is a CloudProvider implementation that caches nothing locally, always connecting to Dropbox for requests. You should not modify this class, and you should not replicate its behavior elsewhere in the code. The MemCacheProvider is a CloudProvider that does nothing, always delegating to the DropBoxProvider. For this homework, you should write the majority of your code in the MemCacheProvider class. CloudDirectory and CloudFile represent directories and files, respectively, while CloudPath is a generic type that can represent either a file or path. You should not need to modify these classes. You should ignore the pool index. CFS is implemented as a FUSE module. FUSE is an interface that allows user (e.g. non-kernel) programs to define a filesystem and allow the system to then mount and use that filesystem. Hence, you will need to have FUSE installed on your machine. FUSE is available for Mac OS X, or Linux (most distributions have the package libfuse-dev). In theory, you should be able to run CFS directly on your Mac or Linux computer. In practice, we will not support this. To ensure that your CFS driver works on our machines without fail, we provide an easy to use VM that has all of the dependencies for this project. We would strongly encourage you to develop (or at least test) your CFS implementation on our provided VM. You will also need to make sure that you have a JDK installed (preferably Oracle’s JDK 1.8.0 >= u60). You will also need apache maven and git. Again, our VM contains all of these dependencies. Our VM is packaged in Vagrant. Vagrant is a frontend that wraps a VM provider (in this case, VirtualBox). First, install VirtualBox. Then, install Vagrant. The configuration for the VM is already included in the repository. After installing VirtualBox and Vagrant, run the following command from the root of your repository: SWE622CloudFS: SWE622CloudFS$ vagrant up. Let it run for a bit – the VM is about 1.3GB, so it’ll take a bit of time to download. If it errors out while downloading, just run the command again – it will pick up where it left off (there seems to be some weird issue with the GMU server). Once it finally finishes, that’s it! Now you have a VM set up and running with everything you need to run CFS. ==&gt; default: Successfully added box 'javadebug' (v0.1.0) for 'virtualbox'! And you’ll find that you are magically connected to this VM, and that the directory /vagrant magically maps back to the directory on your own computer that your git repository lives. You can read more about Vagrant in their documentation. You are very, very strongly suggested to use an IDE for your development tasks – e.g. Eclipse or IntelliJ. With the VM setup that we provide, it should be pretty straightforward to run an IDE directly on your machine, and then do testing in the VM, because your project directory will be shared between the VM and your host machine. Files in CFS are stored in Dropbox. 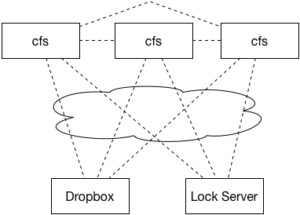 The basic implementation of CFS that you will start from already has all code needed to connect to Dropbox and mount your Dropbox as a FUSE filesystem. If you do not already have one, you must create a (free) Dropbox account. 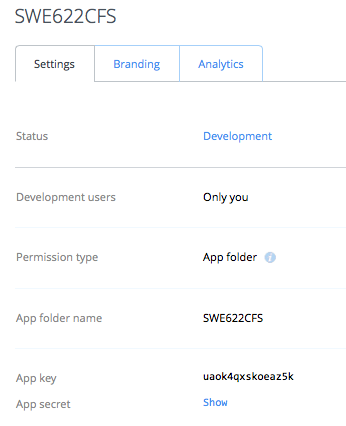 You must also register your project with Dropbox to get an API key. Now, you’ll be taken to a screen showing the overview of your app. Click “Show” next to “app secret,” and then note down your App key and App secret. By default, mvn package will run test cases against CFS before generating the final package. If you do NOT want these tests to run, specify the -DskipTests=true argument. The very first time that you connect to Dropbox, you should do it manually (e.g. not through a test). The tests will not be particularly fast (especially without this assignment implemented) so we recommend that you do not run them until you are ready to. [INFO] Including fuse-jna:fuse-jna:jar:1.0.3 in the shaded jar. [INFO] Including net.java.dev.jna:jna:jar:4.1.0 in the shaded jar. [INFO] Including org.codehaus.groovy:groovy-all:jar:2.1.5 in the shaded jar. [INFO] Including com.dropbox.core:dropbox-core-sdk:jar:1.7.7 in the shaded jar. [INFO] Including com.fasterxml.jackson.core:jackson-core:jar:2.4.0-rc3 in the shaded jar. When we run CFS, it will take a single argument: the empty directory to be used as the mount point for the CFS. vagrant@precise64:/vagrant/fusedriver$ mkdir cfsmnt vagrant@precise64:/vagrant/fusedriver$ java -jar target/CloudFS-0.0.1-SNAPSHOT.jar cfsmnt Logging in to dropbox for the first time... 1. Go to: https://www.dropbox.com/1/oauth2/authorize?locale=en_US&amp;client_id=s3ilyg3nllfa4ud&amp;response_type=code 2. Click "Allow" (you might have to log in first) 3. Copy the authorization code and paste it here, then hit return. 3. Copy the authorization code and paste it here, then hit return. In a new shell window, try to cd into your cfsmnt folder, and try creating a file/folder. You’ll notice that it’s not very fast. This is why we need a local cache. Warning: Dropbox’s API is rate-limited. Errors in your code may cause you to approach and hit this rate limit. If you do, then you’ll need to wait a few minutes for the count to reset. To make it very unlikely that you will hit the limit, do NOT put large numbers of files in your CFS directory (this is why we do NOT want you to share your entire Dropbox with CFS, and instead only a specific folder for the purpose). This assignment totals 80 points, and will be worth 8% of your cumulative, final grade. The grading will be broken down into the three parts as listed below. Your code will be compiled and tested in a clean VM from the image that we provided (e.g. that you set up by typing vagrant up). It will be compiled by running mvn package. Do not modify the pom.xml. Assignments that don’t compile will immediately lose 50% credit. There will be NO exceptions to this rule, for any reason, including that some files were missing from your submission because you forgot to track them with git. It is purely your responsibility to ensure that your submission is correct and compiles. For each part, add a short description in the README.md in your repository describing your high level design decisions and challenges that you faced implementing that part. Your code should have sufficient comments that I can read and understand it. Remember that YOU are the one defining what the files are in this case – there is nowhere that the “hello” file will actually be stored on your computer. Instead, the CFS will create its own filesystem (under, in this case, cfsmnt) and then it is the job of your HelloWorldProvider to make it APPEAR as though there is a single file in the root directory of THAT filesystem. Take a look at the CloudFile and CloudDirectory classes: the goal with the two functions in HelloWorldProvider is to modify the passed CloudFile and CloudDirectory to make the “hello” file appear (with its contents). You should call the various setXXX (or add) methods on the provided file/directory to make the “hello” file appear. (Added 2/2/17): Implementing a CloudProvider might seem non-intuitive if you are not used to writing callback-oriented programs. When you write a CloudProvider, you aren’t necessarily writing some code that will be called immediately: you are defining some functionality that will occur, when something else happens. In this case, whatever you put in openDir will be called by the operating system, when you type ls cfsmnt. And rather than return some value, you change the state of the system by calling methods on one of the parameters to modify it. In this case, in the openDir method, you’ll want to use CloudDirectory.add(new CloudFile...) to the / directory when you’re asked about it. Similarly, in get, you’ll want to fill the passed CloudFile object with information about what the /hello file contains. In this case, you’ll need to set its contents (which should be the bytes of the string “hello world”), and set its length (which you can calculate yourself, or note from the listing above that it’s 12). You only need to implement TWO of the methods of CloudProvider to get this to work – the two that are already stubbed in the HelloWorldProvider. Make sure to consider all of the possible operations of CloudProvider, and cache as appropriate. For instance, when a new file is created, while this will require that the new file is uploaded to Dropbox, future reads of that file can occur without requesting that same file back from Dropbox. You may not use 3rd party code to implement the cache – use only the code provided and classes available in the Java API. Hints: You should probably consider structuring your cache in a way similar to how directories are structured (e.g. as a tree). This will probably make it easier to reason about how things are updated and changed. You can find several simple test cases for your memory cache in the src/test directory. They’ll execute automatically when you type mvn package or mvn test. Note that these are by no means a complete test suite, but should serve as a very basic smoke test to tell you that you are on the right path. You may find it useful to write more test cases to help make sure that your implementation is complete and correct. However, your test cases will not be graded. //Just find the requested directory in that one. Before implementing things, it might help to plan out your locking strategy. We encourage you to write this down in your README.md file. One obvious solution is to use a single lock before touching the cache at all. Hence, it would be impossible for any inconsistency, and in effect, CFS would become totally sequential (single-threaded). This is far too aggressive: there could be no parallelism. This solution would receive 0 credit. While a directory is being listed (i.e. via get), its contents must not change. While a file is being read, it must not be written. While a file is being read, other threads can read it as well. Only one thread can write to a file at a time. You should not synchronize on CloudPath instances. If you synchronize on a path, use the Lock provided by CloudPath.getLock(). Hint: If you use the suggested mechanism above for finding and caching CloudPaths, it should be relatively straightforward to identify which parent directories need to be locked when you access one of their children. Perform all of your work in your homework-1 git repository. Commit and push your assignment. Once you are ready to submit, create a release, tagged “hw1.” Unless you want to submit a different version of your code, leave it at “master” to release the most recent code that you’ve pushed to GitHub. Make sure that your name is specified somewhere in the release notes. The time that you create your release will be the time used to judge that you have submitted by the deadline. This is NOT the time that you push your code. 1/25/17: Clarified how to get a private GitHub repository. Clarified the distinction between filesystems. Clarified that Dropbox app name should NOT be the example name. Gave a few more hints for the HelloWorldFS.